From left, Elizabeth Murillo, Daniel Ibarra, Jacob Juarez, Emily Morales, Emmanuel Garcia, Eduardo Esparza, and Carlos Cortez, in the final scene of the Salinas Movement Project, which debuted on March 31, 2017 at the Alisal Center for the Fine Arts in East Salinas. For members of creative collective Artists Ink, recent shifts in the landscape of policymaking have been a real shock, especially in Salinas, where immigrants contribute to every aspect of life. Suddenly, it was not enough to continue offering free art workshops, waiting for the seeds of change to blossom in others. Suffused with urgency, the group made a radical about-face after the November 2016 election, focusing on creating a single dramatic work to tour throughout the city, hoping to galvanize action. Formed in 2013, Artists Ink’s mission has always been to help young people unlock their potential through the arts. Made up of a core of creative professionals, the group offers mentoring in visual arts, music, theater, graphic design, computer programming, and more. 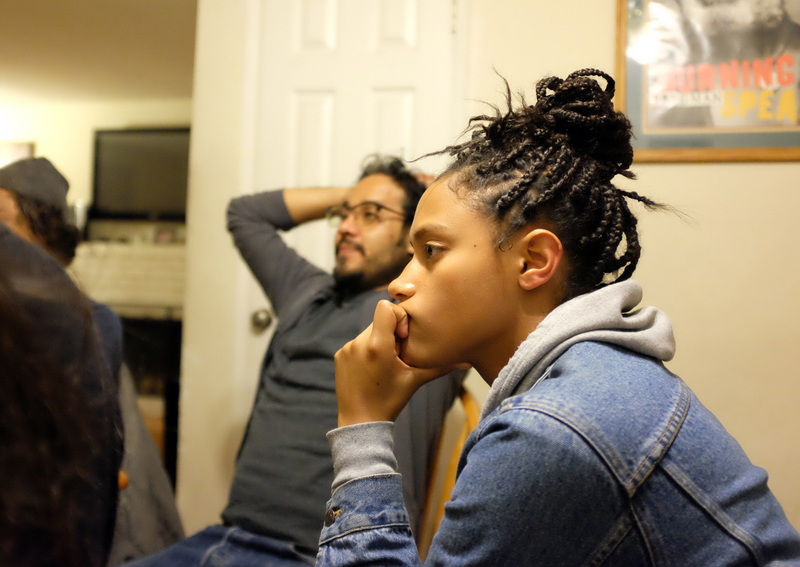 At a brainstorming session in late November 2016, Alba Roland, right, and Carlos Cortez of Artists Ink listen intently as the group writes pieces of what will become the Salinas Movement Project. Born of a simmering anger leavened by hope, the group’s multi-disciplinary Salinas Movement Project seeks to harness that energy in a concerted effort to inspire, instruct, and share, so that others may benefit. It is theater, original work at its best – positive, impactful and painfully relevant. It is also a history lesson, a reminder to youth that they have rights to protect, and roots to be proud of. A number of Artists Ink mentors grew up on the densely packed East Side of Salinas, known as the Alisal. The area generates more tax revenue for the city than any other, yet has the poorest housing, and an unfortunate reputation for gang violence. It’s also a place of intense pride and unsung achievements, where hard work in the valley’s multi-billion-dollar agricultural industry both builds and rends strong families. Being an arts mentor here is especially valuable, because it isn’t easy for kids or families to see a clear connection between self-expression and making a living. Artists Ink mentor Alba Roland, who was born and raised on the East Side, said she didn’t know much about the arts until she got to college. “I feel like the biggest thing that holds kids from this local area back is they don’t believe they have any options,” she says. Now a film student at nearby California State University Monterey Bay, Roland also works as a camera operator for a local TV station. “Our classes are kind of a bridging point, where somebody who has never taken a class can actually go to our workshops and learn something,” he says. Photography and theater mentor Elizabeth Murillo grew up in Gonzales, a town of just 10,000 a short drive away, and notes that becoming an actor really helped build her social skills. The Salinas Movement Project made its public debut in a community preview on March 31, 2017 at the Alisal Center for the Fine Arts in East Salinas. That the day of its premiere annually honors labor organizer César Chávez was not lost on the show’s attendees. The play is a collaborative work, designed to change and grow with feedback. It is written and brought to life by all of the group’s members, which include Morales, Cortez, and Murillo, along with Eduardo Esparza, Emmanuel Garcia, Daniel Ibarra, Jacob Juarez, and Andres Ortiz. Behind the scenes, technicians Dante Carballo and Andrea Felix-Cervantes deliver expert lighting, sound effects and projected media. 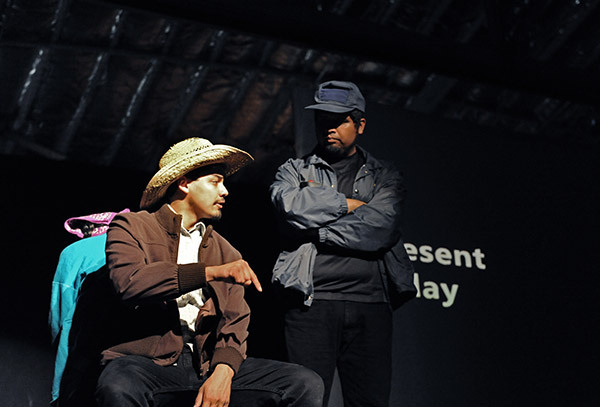 Artists Ink actors Jacob Juarez, left, as a field worker, and Daniel Ibarra as an immigration agent during a final rehearsal of the Salinas Movement Project on March 31, 2017. For those faced with recurring social injustice, the work is a heady cry for action, incorporating voices from migrant field workers to Black Lives Matter protesters. Perhaps no voice in the performance is more plaintive than that of a local high school student shown speaking at a November youth empowerment rally in Closter Park. Rather than being condemned to repeating history, the work suggests that learning from it is surely better, that local communities have positive choices to make, that they can unite, know their rights, and teach important lessons to their children. Followed by an earnest and often emotional discussion moderated by Baktun 12 founder Luis xago Juarez, the community preview was a resounding success. 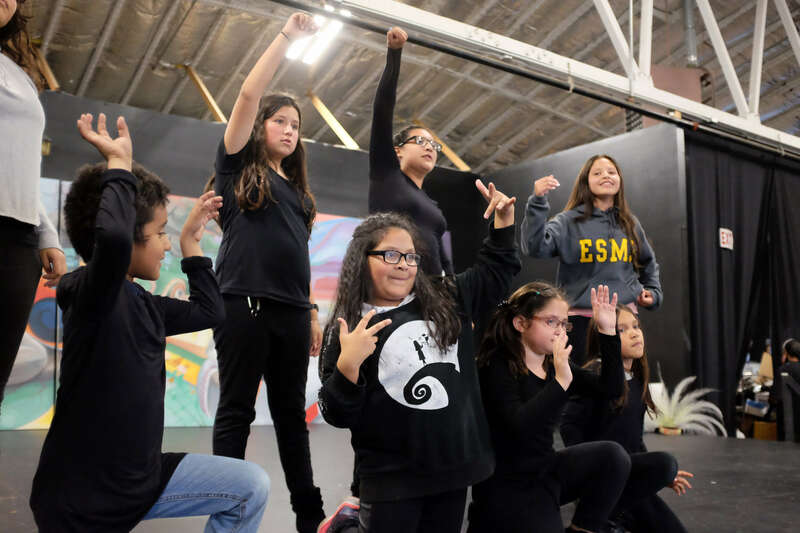 From left, under the direction of Emily Morales, young actors Kendrick Cruz Delfino, Isabela Colin, Daniela Razo, Mariana Razo, Jessica Campos, Lilliana Razo, and Jennifer Campos rehearse their roles in “Journey through Mictlan,” a unique Day of the Dead performance on November 3, 2016 in east Salinas.